What do you get when you cross Disney-level service with a popular ride sharing service like Lyft? An innovative new transportation option for Disney resort guests cleverly named Minnie Vans. This new transportation service can be a great option for some families in some situations, so check out the information below to see if it might make sense for you on your next trip. Step 4: Select "Minnie Van Service"
Who can use Minnie Vans? Where can Minnie Vans go? What hours do they operate? Can I take a Minnie Van to Universal Studios (or anywhere else off property)? Do Minnie Vans have car seats? Should I use a Minnie Van? Where do Minnie Vans drop-off and pick-up? Building on the popularity of ride sharing services like Uber or Lyft, Minnie Vans provide guests with point-to-point transfer in the comfort of a well-appointed (and polka dotted!) 6 passenger Chevy Traverse. Unlike Uber or Lyft (which are both also available on the Walt Disney World Resort property), Disney's Minnie Vans are driven by Disney Cast Members. Ideally this means that you can expect the same high-level of customer service from your driver as you'd have from any other Cast Member interaction at Walt Disney World. 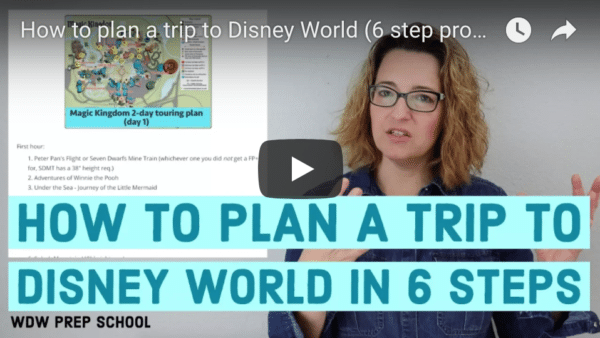 For many families unfamiliar with using a ride-sharing service knowing that the driver is a Disney-trained Cast Member can help to ease any worries they might have when using one to travel to a Disney park or resort. Similarly decked out vehicles are also available for guests using wheelchairs or ECVs at Disney World. Guests needing an Accessible Minnie Van can request one by calling (407) 828-3500. Requests for accessible Minnie Vans can be made 45-60 minutes ahead of time however, because of the limited number available, the wait for the accessible vans may be a bit longer. The cost of this service varies depending on your destination but all trips will start with a flat rate of $15.00 with an additional cost per mile (which is somewhere around $2.75). This is similar to how taxis and Uber/Lyft pricing works where you pay based upon the distance, but, Minnie Vans are now significantly more expensive than those other options with most trips costing around $30 one way. You can see an estimate of your trip cost prior to requesting the Minnie Van by using the Lyft app. Just put in a trip and follow the directions in the section below (just don't hit the "Request Lyft" button at the bottom of the app). For comparison, we tested a trip from Port Orleans Riverside. Regular Lyft was $9.98. But look at the price for a Minnie Van. The exact same trip at the exact same time was priced $26.70. Ouch! Of course, if you need car seats the price of a Minnie Van may definitely be worth it vs. taking a bus. But, for most situations, Minnie Vans definitely aren't the most budget-friendly option available. If you have used Lyft or Uber at Disney World before, the experience for requesting a ride with a Minnie Van is extremely similar. While Disney runs the Minnie Vans service, they utilize the Lyft app for deployment so you'll need to download that app in order to access the service. Once activated, you'll use the app to request a van. To do that, you'll start by entering in your pick-up point and destination. After you've done that you'll see a couple different options, usually "Lyft" and "Lyft XL". Swipe those to the left to get to the other options. Minnie Vans are at the end. Each one will show you the estimated time to be picked up and an estimated cost. Once you select Minnie Van Service you'll be shown a map with all the available vans and the estimated time for the arrival of yours. Since Minnie Vans look alike, Disney distinguishes them with a number system which makes it easy to pick out yours if several pull up at the same time. When your van arrives, climb in and enjoy the ride to your destination. Payment for the ride is all done inside the app so there is no reason to worry about having cash. Your credit card (or Apple Pay if you prefer) information will be used. As of June 1, 2018, the service is available to all guests visiting Walt Disney World (not just those staying at a Walt Disney World Resort hotel). 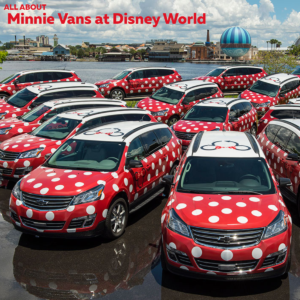 Minnie Vans can be used throughout the Disney World Resort area including all the Disney resort hotels, the four main theme parks (Magic Kingdom, Epcot, Animal Kingdom, and Hollywood Studios), Disney Springs, Blizzard Beach, and Typhoon Lagoon. Minnie Van service to and from Orlando International Airport is now available to all guests staying at a Walt Disney World Resort. It's available from 7 a.m. until midnight. The cost for this service is definitely one of the most expensive ways to get to and from the airport with a price tag of $155 one-way (or $300 for round-trip). Because space to transport luggage is more limited than Magical Express, it is suggested that guests use this service in conjunction with Resort Airline Check-In if utilizing the service for a departing flight. You can book a Minnie Van airport transfer up to 6 months in advance by calling 407-WDW-PLAY. Guests taking a Disney Cruise now have the option to use a Minnie Van for transfer services to and from Port Canaveral. The cost is a $240 each way (plus tip) and can be set up by calling Disney Cruise Line Embarkation Services at 1-800-395-9374. Service is available between 6:30 a.m. and 12:30 a.m (subject to change). No. Unlike Lyft or taxis (both of which can travel throughout the entire Orlando area) Minnie Vans can only operate on Disney property which includes the 4 main theme parks, all Disney-owned resorts, Disney's 2 water parks, and Disney Springs. Plus, when scheduled ahead, Minnie Vans can go to Orlando International Airport and Port Canaveral - but that is all. So, if your plans take you offsite you'll need to check into different options for that. YES! They do. And this is one of the things that make Minnie Vans stand out. All Minnie Vans are equipped with 2 versatile car seats. These convertible seats can operate as both forward facing or rear facing traditional seats or they can also be used as a booster seat (both with and without the back), meaning, as Disney says "even the tiniest of passengers can travel in style." Because it can be tricky for even experienced parents to properly install a car seat, Cast Members that drive them are extensively trained in the proper installation of all the different configurations of the seats. By comparison, you can request a car seat with Uber X, but there is a $10 surcharge and they can only be forward facing. That depends on your situation. 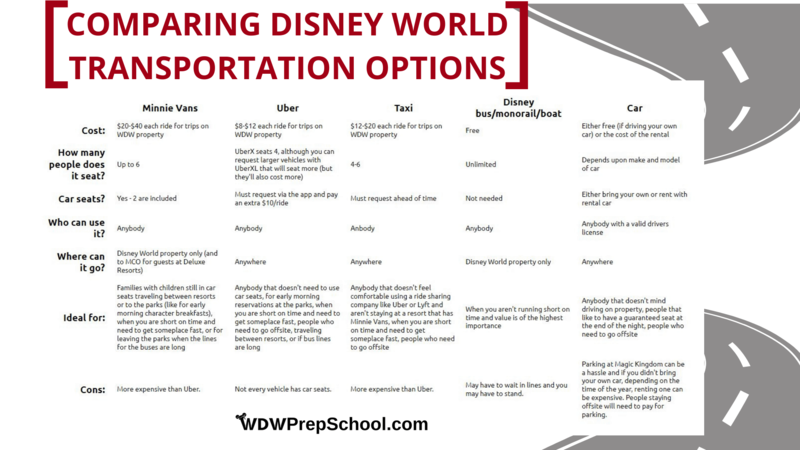 Check out the chart below to see how the different transportation options stack up against one another to help you decide if a Minnie Van is worth the extra expense. If you are going to any Disney resort, Minnie Vans can drop you off at the front, or, if you are headed to a resort that has separate buildings (like Art of Animation) they can drop you off at one of those. You are able to select your building inside of the app. There are 2 designated pick-up locations at Disney Springs: at the Taxi Station on the far west end past the AMC Movie Theater and at the far east end. Drivers usually ask where you are going at Disney Springs and then will do their best to drop you off as close as they can. The parking/bus/taxi area for the water parks are relatively small compared to the main theme parks, so your drop-off and pick-up points are nice and close to the front of the parks. 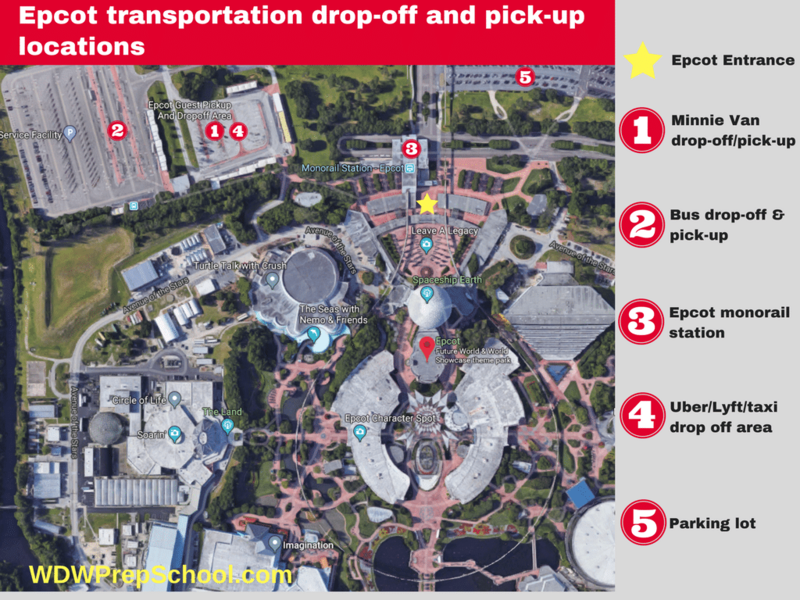 One of the best perks when using Minnie Vans for transportation to and from Magic Kingdom is that the drop-off and pick-up location is actually located at the same area where the resort buses drop-off and pick-up. This is different from Uber/Lyft, taxis, and driving your own car. 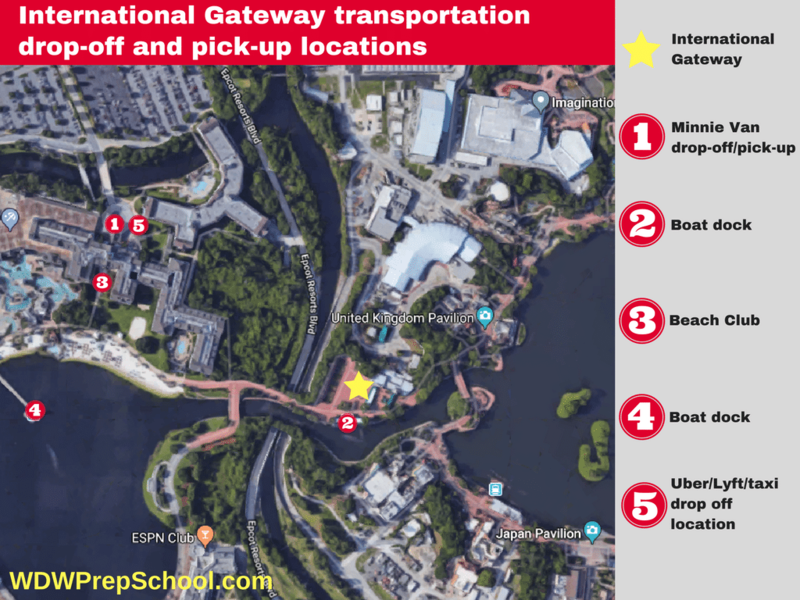 All of those options require you to start your journey to Magic Kingdom at the Transportation and Ticket Center and then to transfer onto either the monorail or ferry in order to get to the park. Minnie Vans drop-off and pick-up near where the buses are located out in front of the park. If you are leaving from the back of the park, though, it usually makes sense to walk through the International Gateway and over to the Beach Club Resort to pick up a Minnie Van there instead of walking all the way back around to the front of Epcot. 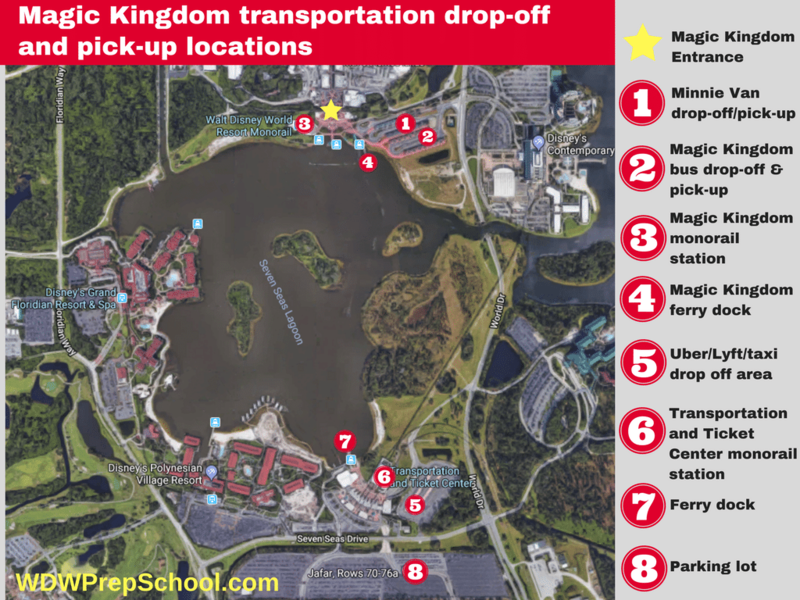 Like Magic Kingdom, Minnie Van drop-off and pick-up is located at the bus loop where the resort buses drop off and pick up. As you may know, Hollywood Studios is currently under a massive amount of construction so the location of the drop-off and pick-up may change, but as of now you'll find the Minnie Van drop-off and pick-up locations near the front of one of the parking. 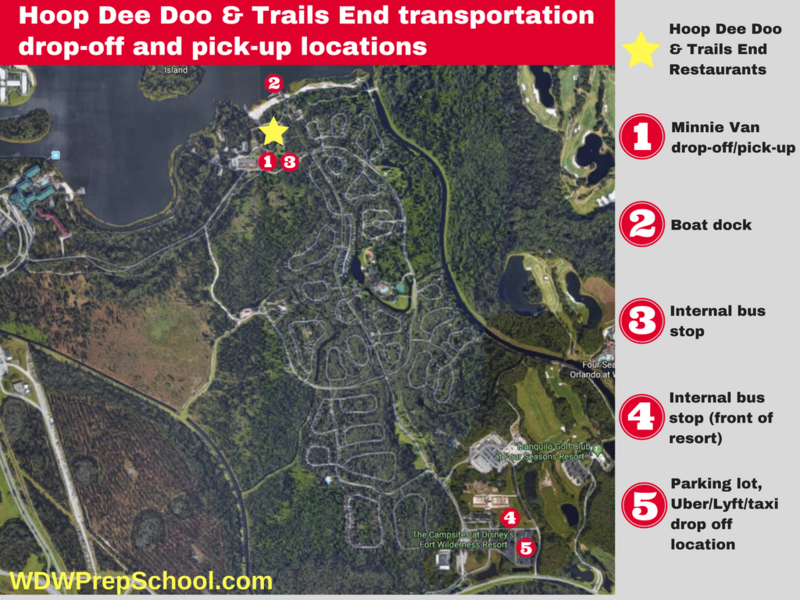 Hoop-Dee-Doo has long been a family-favorite, but before Minnie Vans your only options for getting there usually involved transferring between regular Disney buses onto the internal buses for Ft. Wilderness or arriving by bus/monorail to boat. This process was not only cumbersome but also extremely time consuming. And, after a long day, the multi-step process to get back to your resort was especially exhausting. Minnie Vans, however, are allowed to drop off and pick up just a short walk away from where these two popular restaurants are, saving you a lot of transportation time. The price has gone up significantly. Now, you're looking at probably at least $30 per trip. On the positive, originally Minnie Vans were only available at a few resorts (which was a definite con) but now they are available at all Disney World Resort hotels. Have you tried out the new Minnie Vans yet? Thinking about using one to get to a Disney park? Let us know how it went in the comments. I have a “quick tip of the day” If after fireworks in magic kingdom the transportation area is packed and you just want an Uber or lyft and all the Minnie Vans are occupied or you don’t want to pay the price, you can Walk over to the contemporary and grab a lyft or Uber from there. We also have UBER or Lyft drop us off at the contemporary on busy mornings and walk over to save us from the busy transportation area. When we were at WDW back in June 2018 a Minnie Van driver mentioned that transportation going to and from Wyndham Bonnet Creek would soon be an option. Has this happened or is it planned to happen since it’s technically on Disney property? Thanks! Can you book a Minnie Van for any ride 6 months in advance or is it just airport trips? I have a trip coming up and a tight timeline between a ADR and a paid event that a Minnie Van could alleviate. I’d consider booking in advance to make sure the Van was ready to go vs having to call for it and then having to wait for it between my reservations. If we are there during Christmas and we want to go the Magic Kingdom on say Dec 23 or 24, how likely would there be a Minnie Van available in the morning? Are they too popular now that it will take a while to get one to the resort (we will be staying at Port Orleans Riverside)? I’m trying to figure out the best method of transportation without having to rent a car during this time. Thanks! With 5 passengers ( 2 Adults & 3 children) only one child needs a car seat. Will I have room from a folded stroller? Yep, you should. The back of the vehicle fit our folded double stroller. Depends on if you have luggage with you though. We were counting on Mini Van service from the Grand Floridian to Ft Wilderness for dinner. I had twins who were 5 at the time and a 3 year old. The vans do come with 2 car seats but they would not allow us to use our own boosters that we brought for the twins and required that we use 2 vans. They provided the second van for free for the ride out but we had to pay for 2 on the ride back. It also took a LONG time to get 2 vans out at Ft Wilderness at night. I’m hoping next time we go they will be more useful. I wish I had known they can’t take 3 kids under 6. Recently stayed at Animal Kingdom Kidani Village. We had an early morning Magic Kingdom Bibbidi Bobbidi Boutique appointment for my niece the first day. Went through the Minnie Van process with hotel desk staff the night before, got up and went to get one at 6:50am, and there was not a single van near us. Waited 20 minutes and still nothing, bus service wasn’t running yet because the park didn’t open until 9am, so my brother got an Uber. Then had to go through the chaos of that far away drop-off at the ticket and transportation center, and the monorail (we just missed one) to the Magic Kingdom, finally! And with only a 10 minutes window to get to her appointment, after leaving the hotel room 2 hours before. We did also try to use Minnie Vans 2 other times during our week long trip, as well as opening the app periodically to see if any vans were around, and nothing ever was. Maybe it’s just that that resort is a little out of the way? Don’t know, never had a need for it from any of the others. Stuck with Uber if we needed it. Uber driver said that they’ve actually been getting a lot of people riding with them recently that had the same problem. All I’m saying, is if you HAVE to be there at a certain time, I wouldn’t depend on the Minnie Vans. With all of the construction in Hollywood Studios parking lot/bus station, where are drop off places now? We use Uber/Lyft and would like to know how much farther, if any, they are now. Hi, I won’t stay at a Disney Resort so I was wondering if I could take a Uber or Lyft to one of the Disney resorts and then ask for a Minnie Van to go to the parks? Sure, but that would be a bit too much money and work, I think. Just have Uber/Lyft take you to the parks. Can you use the Minnie van for 6 adults and 1 child is there enough room? We are planning a trip. We will have 6 people (no little kids who need child seats) but will ALSO have a scooter. Will that work with 1 Minnie Van? Just got back from my Disney vacation and used the Minnie Van service twice! It was amazing. I have 4 year twins that needed booster seats and we had morning breakfast reservations. Minnie van driver(s) were amazing. Chatted with us and let us know that there was 1 whole day dedicated to car seat installation. It was worth every penny. 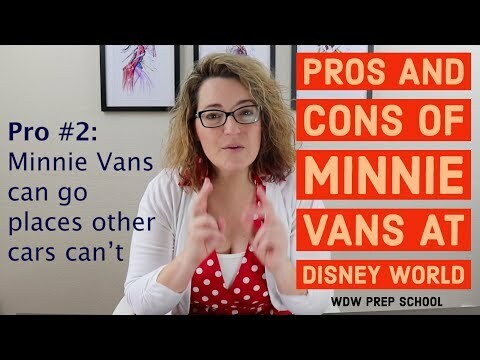 One con though, Minnie vans have become popular and just because you request your ride, doesn’t mean there is a van around. After waiting 20 mins to grab one, we ended up having to take a bus (thankfully arrived on time). So I’d start requesting the van 15 mins before you ideally want one because it could take up to 10 mins to grab a van, and then include travel time for the van to come to you and then take you to your destination. We will be staying at the fort Wilderness RV campgrounds. Will the Minnie Vans be able to pick us up at our site? Does this include swan and dolphin? Will the Minnie vans be available for Shades of Green guest? Will the Minnie Van pick up from International Drive and take you to Disney Resort? No, they will only pick up at Disney resorts. You’d need to use something like Uber or Lyft to do that. To use the Minnie Van service with a scooter, does the scooter have to be one that folds up or does accommodate the ones that are full size? They can take full size. I used it with mine in December. We used a Minnie Van on our trip in January, and I can’t sing their praises enough. After all the news reports about Uber drivers not being vetted carefully enough, I was happy to know that a Cast Member was driving. ( I realize that the crimes committed by Uber drivers were isolated incidents, but nothing can foul up your vacation more than a mugging or assault, and a small risk was too much me.) We spoke with our driver, and they have to have an 8 hour class on using the different types of car seats they carry before they can drive. For us, that was a huge plus, and the carseat they had for our 4 year old was a good one. For our 4 year old, the biggest plus was that he got to ride in another cool form of transportation on our trip. It ranked up with the monorail! For me, the biggest plus was getting to go from a monorail resort to the Kidani Village without having to take more than one bus, and not having to wait twice. We are getting in late in the afternoon on day 1 of our spring break trip, and staying at AK Kidani Village. I think we are going to take Magical Express to the hotel, but then drop our things and go straight to Magic Kingdom for the evening. Minnie Van seems like it may be worth it to not spend even more time in transit. I used a scooter on our trip 12-22-12-29. We used the Minnie Van service and it was quick! We only waited 15 minutes for the van to arrive at Wilderness Lodge. We had room for my scooter with me strapped in ,and 4 other adults. The service still was only $20.00. Uber is the way to go. We never had to wait more than 3 minutes or pay more than $10 for a ride. Beats waiting for buses that are almost always late and packed. Used the Minnie Vans multiple times during my November trip. Made getting to magic kingdom a breeze. We also used the bus service but if we were in a hurry or weren’t in the mood to wait we ordered a Minnie van. Even after magic kingdom fireworks we waited no more than 5 minutes for a pick up. Definitely recommend! We used a Minnie Van last week and had a fantastic experience. Took us from the Poly to Hollywood Studios for an 8am breakfast reservation. The Minnie Van arrived quickly, our driver was excellent, and it made getting to an early breakfast very easy. Our driver has been a cast member for over 20 years and shared tons of Disney knowledge with us. We needed two forward facing car seats. I was extremely impressed with the cleanliness of the seats and car and our driver was extremely knowledgeable about car seat safety. We will not hesitate to use a Minnie Van again. Loved using the Minnie Van service during our trip in September! Might be the exception, rather than the norm but we used the service to get to AK for morning EMH when we overslept! But we got dropped off at the back side of the bus area which was a little bit further of a walk but more convenient given the lines to get in.